Mental Health Speaker for Mental Health Professionals, Teenagers, and Parents - Specializes in Teen Suicide, Teen Suicide Prevention, Teen Depression, Teen Stress, and Teen Anxiety. 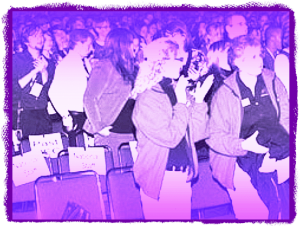 Mental Health Speaker – Silence the Stigma . . . Be Proud of You! Whether you are considering Jeff for adults, teens, military, law enforcement, college campuses, school communities to speak on mental health awareness, suicide prevention, suicide crisis intervention, or helping a school and community move forward after the loss of one of their own, Jeff is not necessarily the PRODUCT, as much as he is a part of your community and listens to the needs of your administration, community members, and the people that hire him. Every school and every community is different in what they need, at the time they need it, and how they want to address the circumstances. Jeff always tailors his message to your needs, your theme, your objective. Jeff is a professional and has helped hundreds of communities, schools, and families. Jeff is a guest and always puts himself as one of your staff members working with the counselors to give hope, understanding, and inspiration. Having said that, you can rest assure, Jeff will make you a HERO and deliver exactly what you need. TWO AND A HALF DAYS, Jeff Yalden changed a community from despair to prominence. Another community, a suicide contagion, Jeff Yalden spent five days in Woodstock, Ontario, CANADA after the Canadian Mental Health Association called Woodstock, “A City in Crisis!” Not a teen suicide since Jeff’s visit. Many communities, all with different needs, have invited Jeff to help. Jeff is not the savior, but he makes sense. He is real. He understands because he lives with mental illness and battles the challenges every day himself. Jeff speaks truth, gives hope, and gives answers to a ver complex epidemic plaguing our youth today. Silence the Stigma . . . Be Proud of You! When you want a dynamic mental health motivational speaker for your conference, hire someone that lives with the symptoms we are talking about. Read about Jeff Yalden and see who he is and why he is who he is. You’ll be inspired and you’ll want Jeff to share his message with your people who are at the forefront of working with mental health in your communities. Jeff Yalden struggles with mental health challenges himself – depression, anxiety, bi-polar type 2, and PTSD. He says, “He’s one of those people!”, because of the stigma that is associated with symptoms above the shoulders. As a matter of fact, after 17 years of marriage, Jeff will tell you his bi-polar and anxieties were the demise of his marriage. Thought they are still good friends with great respect, Jeff realized things needed to change. What makes Jeff special is the fact that he has Mental Health issues and accepts it, but has learned to cope with the triggers and invests two times per month in counseling for the past 25 years. “Why I am the way I am makes me a special person.”, says Jeff. For years, Jeff has been committed to his work with educators and parents talking about depression in teens. He is passionate about sharing his stories with his audiences. Whether it is teenagers and the challenges they’re facing in today’s world with expectations and inadequate feelings of self-worth as a result of comparisons to others on social media platforms. Or, inspiring teachers, coaches, and mental health workers to understand how important their work is to take the stigma away from those that suffer everyday. Jeff Yalden talks candidly about his routine and how he deals with everyday triggers. Jeff is real and genuine and knows that sharing his story makes him vulnerable, but he also knows that his story makes a difference in the lives of those that suffer, and those that help those that suffer, understand. Jeff is renowned for his work with teen mental health – teen suicide prevention and intervention, teen depression, teen suicide training, teen mental health, and helping school communities move forward after the death by suicide of one of their students. If you are looking for a Teen Suicide Expert or Suicide Prevention Specialist that focuses on teens and mental health, look no further. Let Jeff Yalden come and train your teachers and share his theory on today’s teen suicide epidemic. Also, consider having Jeff train your staff – Suicide Prevention Training Online Courses for Teachers and Staff. When a school community suffers a death by suicide of one of its teens, the school community knows that Jeff Yalden will answer prayers and make sense to parents about the speed of hurt for today’s teens. Jeff also is candid and appeals to teens helping them understand that suicide is not a solution – ever! Jeff relates to teens in a way mental health professionals can’t. They understand Jeff and Jeff understands them because Jeff has been there. Hospitalized twice – Age 16 and 21 with feelings of suicide and adjustment disorder, Jeff had to figure things out. This is the age where Jeff and his message come from to where he is now. A riveting story of life and a search for meaning. Learn the benefits of Mindfulness Meditation and how you can own the day before the day starts to own you. Reduce anxiety and stress with just three minutes a day. Aside from Teen Suicide Prevention Training with Jeff Yalden, Jeff also created a mental health program for teens and staff members designed to improve the overall well being of our teens. The course reduces discipline, lowers stresses and anxieties of our teens trying to keep up with teen life and expectations and most importantly the course is designed to improve school morale by creating a safe and compassionate environment fostering relationships and ultimately improving test scores. 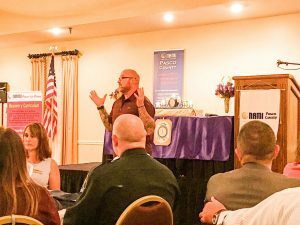 Why Jeff Yalden for a Full Day in Your Community? As a result, you get a professional who understands and has had to fight himself. Oh, and by the way, “No! Jeff has never had an issue with emotions while working with teens, in a building, or speaking professionally.” We knew you’d be thinking that. Jeff has 23 years of mesmerizing audiences. He has 23 years of touching hearts and changing lives. * School Assemblies are about motivation and self-respect. Jeff teaches the students how to overcome obstacles by asking better questions. He talks about the his own personal challenges and how he learned to understand expectations versus objectives and how we live. Which one brings disappointment? Which one brings personal responsibility? Jeff is fun, engaging, and the students love him because he is real and easily relatable. ** Consider Jeff for a full day program rather than just an hour school assembly. Why? VALUE! VALUE! VALUE! Understand the stigma of mental health and you’ll have a clear perception of how people look at you. Mental Health does not define us, but how we act and how we deal with mental health is what defines us as people. Jeff Yalden shares his story of 25 years of counseling and anger management. Jeff challenges his audiences to know that we all battle mental health issues in everyday life. 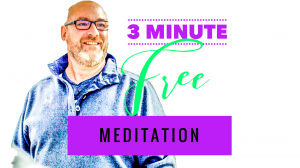 You’ll be inspired by how simple Jeff takes mental health and turns it in to a life of gratitude and fulfillment. Dealing with mental health himself has taught him many lessons in life and those lessons, the wisdom, and experiences, Jeff shares with his audiences. Stigma is when you are labeled or judged due to perception about your illness or disabilities. It’s often seen as a mark of disgrace. People judge you and believe negative stereotypes about you because they think you’re different. This often causes them to avoid, reject, and discriminate against you. When you don’t understand this then you feel inadequate and worthless. Stigma also exists when you judge yourself, believe negative things about yourself, and feel ashamed because you think you are different than everyone else. You can’t give Stigma the power over your own emotions. What happens when we don’t deal with the stigma of Mental Health? It’s a cycle of shame that leads to being silent. Being silent gets into your head and you become self-destructive in attitude and behavior. This not being dealt with could lead to suicidal thoughts or self harm. If one doesn’t get help, this process repeats itself and becomes and endless spiral downward of self-destruction and feelings of inadequacy. Silence leads to self-destructive behavior and suicide. The process repeats and it becomes an endless, downward spiral.